Perhaps the most famous contemporary philosopher, Slovenian Marxist and Cultural Theorist returns to our screen's with the enjoyable but frustrating PERVERT'S GUIDE TO IDEOLOGY. It looks and feels the same as has more narrowly focussed and more tightly argued GUIDE TO CINEMA, with Sophie Fiennes effectively filming him giving a lecture. The clever visual twist is to have him discuss cinema (and in this case, modern history and culture more generally) by inserting him in costume into the clips he is discussing. Thus, when we discuss TITANIC, we have Zizek in a tux on a life raft. When we see him discuss THE SOUND OF MUSIC, he is in a cassock in the Mother Superior's office. This is an incredibly winning conceit and takes us into the heart of the topics he discusses. And what is he discussing? The concept that ideology is not the obvious political discussion or propaganda that we expect to encounter, but rather the hidden meanings in everyday artefacts. We must look through the superficial ideology to get to the true ideas that govern us. As fans of Zizek will be well aware, the pace at which he produces his off-beat ideas, the complexity of the language he uses, and the eccentricity of accent, means that really paying attention to the discussion can be exhausting, and my suspicion is that this would have been a better film if it had had a shorter running time. This could have achieved by tighter editing of the lecture. Zizek has always been one of those thinkers who throws everything at the wall. To be sure, within that, you find one or two ideas that really stick - really make you reassess what you think about something - but a lot of it can just seem random and poorly organised. A case in point is the fact that his analysis of the class message in TITANIC really did make me look at that film again - that underneath its superficial Marxist promotion of working class authenticity, it is actually a deeply conservative movie in which the upper classes must ditch the working classes to survive. But Zizek's quickly discussed idea that Christianity is more atheist than atheism just wasn't fully developed enough to be convincing. Slavoj Zizek and director Sophie Fiennes. 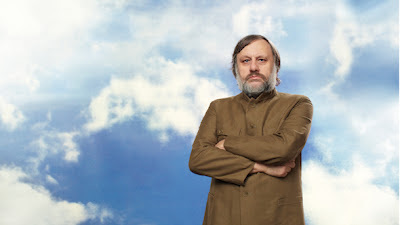 THE PERVERT'S GUIDE TO IDEOLOGY played London 2012 and does not yet have a commercial release date.